I’ve been to Suda Thai before. But, for their first birthday party, not really an event where we could judge the food properly – we were far too engrossed watching the Thai cookery demonstration and drinking Thai beer and cocktails. So, I was delighted to be invited back for lunch to try a new dish created for their oyster festival in conjunction with Maldon Oyster and taste the food properly! 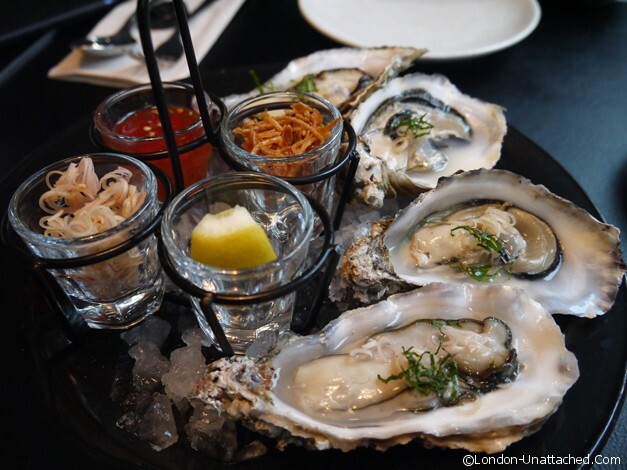 We started, as you should, with Maldon Oysters served with lemongrass, shallots and lemon and a traditional Thai vinaigrette and a glass of champagne to wash them down. I really like oysters and I’m quite happy to eat (a lot) of them with just a little lemon juice. But the accompaniments of crispy shallots and a slightly hot vinaigrette did work remarkably well. And, the oysters were spot on, juicy and very fresh tasting. My main course of Choo Chee Pla was very good. 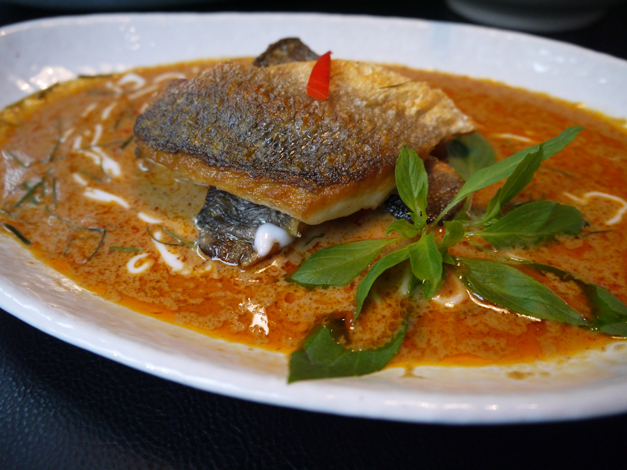 Crispy skinned sea bass fillets on a tangy red curry sauce. Presentation was great and the whole dish well balanced with just enough kick. 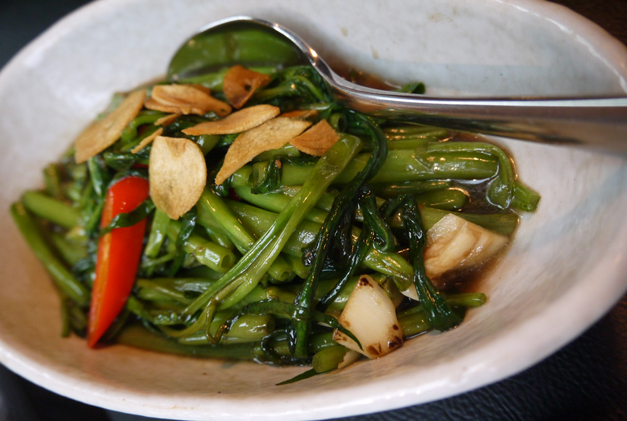 Rice and chinese water spinach stems were good side dishes for what is quite a delicate dish that could be overwhelmed by a spicier starter or side dish. My dining companion chose a noodle dish, Guay-Teow Pad Kee-Mao Talay which apart from having a VERY long name looked quite substantial. 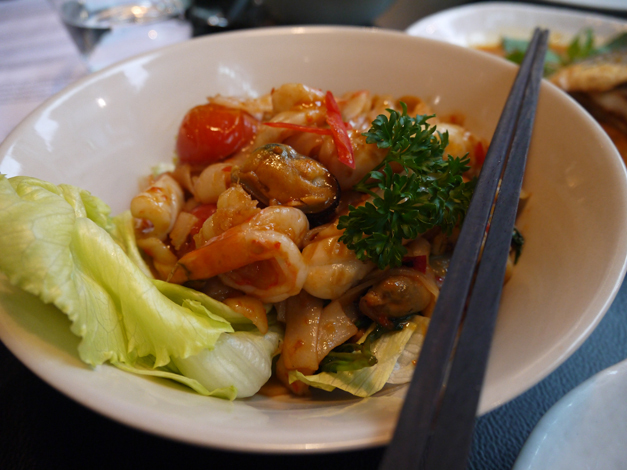 It was a mix of seafood with a spicy sauce – generously proportioned this would be a meal in itself for most of us. But it was nevertheless dispatched with great gusto! 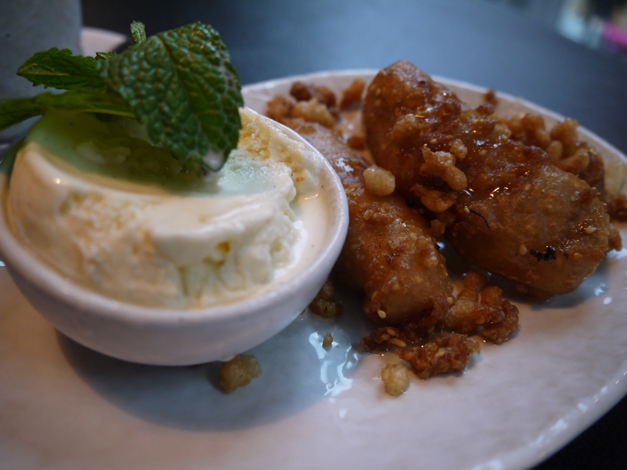 After that, we almost avoided dessert, but in the end we were pleased that we shared a dish of Gluay Hom Tod, banana fritters with honey and sesame served with vanilla ice cream. Light and crispy, not overly sweet so perhaps adapted for a western palate, these were a perfect end to the meal. Suda Thai is set just off Long Acre in St Martin’s Courtyard, a small complex of new shops. With large windows looking out over the courtyard, the restaurant is light, clean and spacious and if you wanted a quick lunch it would be a great place to sit and people-watch. The service when we were there was efficient and full of typical Thai charm. But, we did arrive after normal lunch service at around 2pm when the restaurant was almost empty. Prices are moderate – this is a café-restaurant and you shouldn’t end up paying much over £20 a head for food, with a reasonably priced drinks menu to complement the food that includes a range of Thai wines. Many thanks to Suda Thai for the opportunity to review. Ooh…The oysters look and sound so delicious… Stopping here has made me a little hungrier than usual 🙂 Thanks! Oh the oysters look so yummy and fresh! Everything else looks great too – one to archive for a visit. they were an afterthought, but don’t they look yummy! Amazingly, we are both carnivores, but the fish here was so tasty, I wouldn’t have eaten anything else!